Congress, never all that well known for thoughtful deliberation with a mid-term election coming up, has voted a torrent of hush-money for a babe named Katrina. Anything to keep her quiet, anything at all. Our behind-the-curve president has asked for nearly $70 billion in a week and if it takes a hundred, the votes are there. This last outpouring of money passed the House 410 to 11 and the Senate 97 to nothing. What voice of reason can be heard in that stampede? Everybody in Washington is on this money train. Louisiana plans to ask for billions (a hundred, two hundred?) to upgrade New Orleans levees, rebuild highways and infrastructure to lure back business. Business has been voluntarily leaving New Orleans for two decades. By 2050, the Gulf of Mexico is expected to be two to three feet higher than it now is and somebody better blow the whistle for a time-out before we find ourselves $25 billion down that hole in the ocean. It may well be that politicians, historians and those who simply love the Crescent City’s vibrant past will have no real say in its future. Insurance underwriting and development capital are likely to be unwilling to go where no Congressman fears to tread. Capital markets have no nostalgia. The difficulty is that a heap of money can be lost to infrastructure before that reality becomes clear. The very first order of business should be to test the capital markets. Not with dreams, with commitments. It’s not an opportune time to bring such things up, but I am not a politician with an election at hand and a badly bungled hurricane response. New Orleans is, for the present, mostly a ghost town. There is time and there is a deadly serious requirement to look at what we’re doing and why we are doing it. The hundred miles of shipping ports along the lower Mississippi don’t need New Orleans. Neither does business, as its disproportionately vacant office buildings attest. 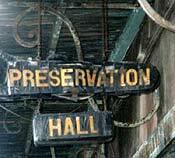 When I was there six years ago, jazz could be found but you needed a deep breath and a guide to get past the hip-hop and techno to finally stagger into Preservation Hall. There is exquisite architecture in the wealthier neighborhoods, but the poverty and murder rates belie its reputation as a grand old city. Nostalgia is not a reason for a city to exist, even if it were possible. There is money that must be spent and spent immediately, but not for rebuilding. Those who lost everything and have no resources must be clothed and fed, found jobs and their children educated. If all else failed, we are large enough for that, must take those responsibilities and be grateful we are able. This wide nation can easily accept two or three hundred thousand people and give them a lift. I don’t doubt that we can control to an acceptable level of theft the money that might be spent to rebuild New Orleans. That’s not my point. This city, by all logical standards of measurement, is no longer economically, historically or socially viable. The past four years of this administration have increased our national indebtedness by a factor of 50% of all the debt this nation has acquired since 1776. A three trillion dollar increase, three thousand billions shot down the pipe to our kids and grandkids. Congress, in its unconscionable dereliction of fiscal duty, has made that possible. $450 billion in 2002, $984 billion in 2003, $800 billion in 2004 and , between our undeclared and unfunded war, hurricane Katrina and the additional insanity of the Bush tax relief demands, probably another $1,000 billion this year. With no end in sight but national bankruptcy.